Do you ever feel pain when you bite down? Have you noticed visible holes or stains on your teeth? You may have a tooth cavity. Decay, teeth wear and fractures can damage your tooth structure, creating a cavity. To restore the cavity, we replace the damaged tooth structures (enamel and dentine) with a dental filling. The cost of having your teeth filled and restored. Worried about how your teeth will look after they have been filled and restored? Historically, dentists offered many different types of restorations such as amalgam, gold, composite resin, GIC (glass ionomer cement) and porcelain. 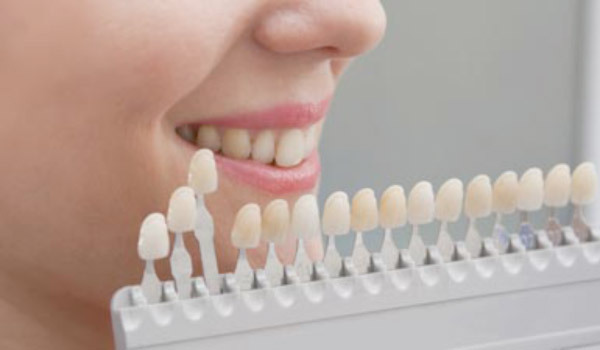 Thanks to modern dental technology, we now offer tooth coloured, white fillings, which are durable and natural looking. What type of tooth coloured fillings are available? We use two main types of fillings – composite resin and porcelain. Composite fillings are also known as white fillings. This is because composite resin fillings are tooth coloured material available in various shades that can be closely matched to your individual tooth. Composite resin is a material that is made from resin matrix and glass ceramic particles. Over the last 20 years, the composite resin filling formulation has improved in reliability, aesthetics and strength. For your small and medium size fillings, we use composite resin fillings. How is composite resin filling applied? Composite resin is similar to soft putty in consistency and can be sculpted and moulded in and around your teeth. We bond the composite resin onto the surface of your tooth using adhesive agents. 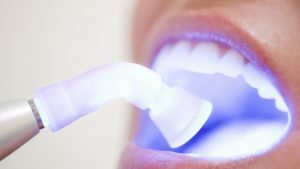 Once we have moulded the desired shape, an Ultraviolet Blue light is used to harden the soft composite resin to a hard white filling. They can be adhered to your tooth structure. This is vastly different to traditional filling materials like gold or amalgam, which “sit” in the prepared cavity space of the tooth with a cement to seal the join/gap between the tooth structure, and the filling material. Composite resin is bonded directly onto the enamel and dentine essentially replacing your “lost” tooth structure. 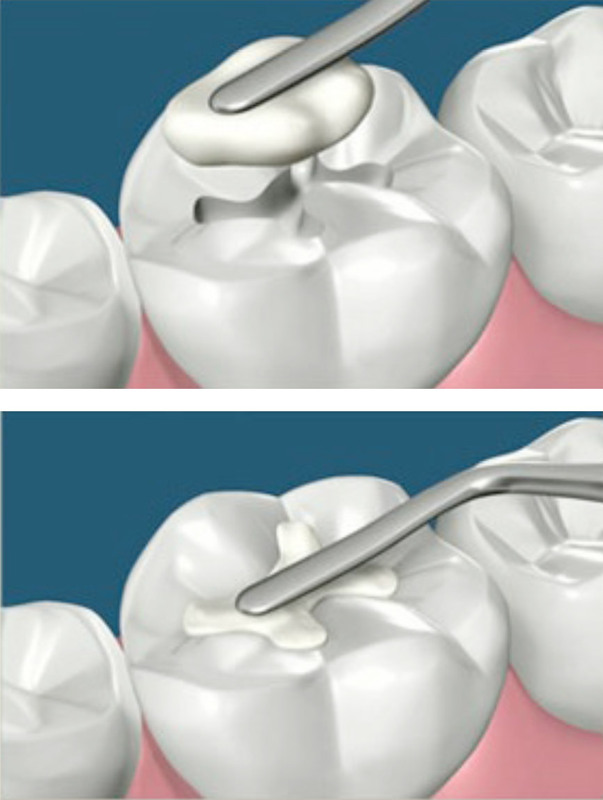 This bonding process strengthens the tooth structure. Are available in various shades to match your natural teeth colour, shade and translucencies. When an experienced dentist uses composite resin they can artistically emulate the natural beauty of each tooth. 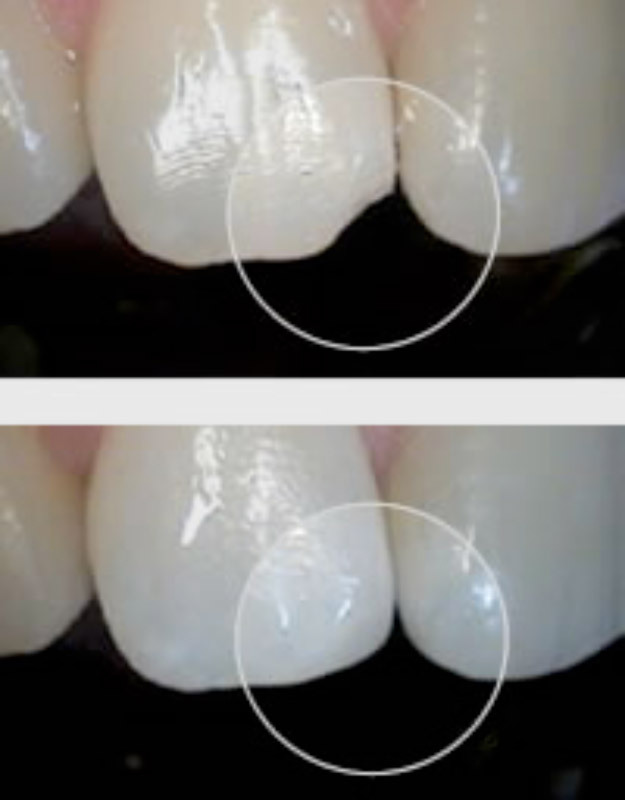 Are mostly used in small to medium size restorations. If you have larger tooth defects, we use other tooth coloured alternatives including porcelain, onlays, inlays, veneers and crowns. Can be directly placed on your tooth in a single appointment. This reduces the cost and time required for your filling. We use Composite Bonding (or Teeth Bonding) to improve the cosmetic appearance of your front teeth. Composite resin can be used in your back teeth and front teeth. This treatment is effective for front teeth decay, congenital defects, fractures (due to trauma such as a fall) or closing gaps between the teeth. Repair small fractures or irregularities of the multiple front teeth to even out the smile line and create visually pleasing shapes. To rejuvenate your smile, composite resin bonding is an economical and conservative solution. Sometimes porcelain restorations such as veneers and crowns may be considered a superior option to composite resin bonding because they have better aesthetics and strength. When there is a larger amount of tooth defect to be repaired, we use porcelain onlays or inlays. This is due to the inherent strength of porcelain, which is superior to composite resin. Porcelain dental inlays and onlays are custom made ceramic restorations that are shaped to fit your teeth perfectly. They’re similar to porcelain veneers or crowns because they’re made in the dental laboratory from the model of your teeth. To ensure the custom-made restorations mimic your natural teeth in function and appearance, we only work with local ceramists who are well known for their artistry and attention to detail. The porcelain onlays and inlays manufacturing process produces highly aesthetic, strong, stain resistant restorations that prevents further decay and strengthens your tooth structure for many years to come. Local Anaesthesia: To make your procedure comfortable we use local anaesthetic to numb the tooth and its surrounding area. We are highly skilled in giving painless injections. Our patients tell us they feel little, if any discomfort. Shade selection: We try our best to match our choice of composite resin to your individual tooth. Rubber dam: If possible, we place a rubber dam over the mouth that isolates the tooth being worked on in a clean, dry and sterile area. This means you don’t get any water splashing at the back of the mouth. Most patients find the rubber dam quite comfortable, as the stretching of the rubber assists in keeping the mouth open. Removal of decay or preparing the tooth surface: If there is any decay, the diseased part of the enamel and dentine is removed. The rest of the healthy tooth structure is then cleaned and prepared, ready to receive a filling. Etch and bond: Your tooth surface is etched with acid gel and resin bond is applied to start the bonding reaction. Place composite resin: The soft putty-like composite resin is sculpted and moulded in and around your prepared tooth. The Ultraviolet Blue light is used at the end to harden the composite resin. Bite check & Polishing: The restorations are ready to be used immediately with its full strength and hardness. Your bite is checked and any polishing is carried out to ensure the new filling is smooth and comfortable. After care: Although the new filling is ready to be used in normal function, there may be residual numbness from the local anaesthetic. We recommend you avoid hot food and beverages and also avoid chewing hard food immediately after the procedure. This prevents any untoward burns or accidental biting of soft tissue in your mouth. Sensitivity to hot and cold: Because your tooth has been through the process of drilling, drying and cleaning as well as bonding of a new material for a filling, it may be a little sensitive for several days afterwards. It’s normal to experience some cold and hot sensitivity during eating and these symptoms should subside gradually. If you’re experiencing greater discomfort, please contact us for further investigation.